The American Cancer Society (ACS) has issued new guidelines on how to most effectively screen for breast cancer. The new guidelines come after the ACS performed an exhaustive review of available literature on screening practices, evaluating patient outcomes and the risk of unnecessary procedures. Now, the ACS is recommending that women start undergoing mammograms only after age 45, up from the previous age of 40. Additionally, the ACS is saying that patients can opt to skip manual breast checks by physicians with minimal consequence. 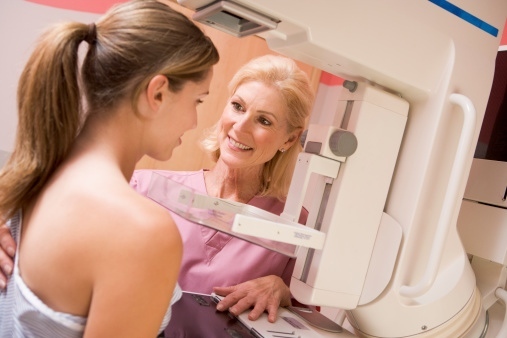 These new guidelines are at odds with the American College of Obstetricians and Gynecologists, which advises starting mammograms at age 40, and the U.S. Preventative Services Task Force, which advises starting at age 50. The differences between the three organizations are based on how they weigh the pros and cons of mammograms. Mammograms have a notoriously high false positive rate that is highest in women under age 45, when their breast tissue is at its densest. This makes it harder to tell tumors apart from regular breast fat. While a mammogram is a relatively mild procedure, a false positive results in more complicated and painful biopsy procedures. There is an additional risk that an early mammogram could find tumors that would never progress to the point that they would cause harm to a patient, resulting in treatments that have ultimately been unnecessary. Breast cancer survivors who were diagnosed prior to age 45 are skeptical of the ACS guidelines, many noting that the false positive risk would be worth it for the chance to stop cancer early. Back in 2009, when the U.S. Preventative Services Task Force upped its recommended screening age to 50, a similar furor developed. The ACS, for its part, notes that women under 45 years old can still receive screenings if they wish, though they should be made aware of the risks involved. Women who have a predisposition towards breast cancer are still advised to be screened early and regularly. Other critics of the new guidelines note that the ACS only looked at whether early mammograms resulted in increased survivability. The ACS review, according to some groups like those behind Breastcancer.org, didn’t take into account cases where catching cancer early let women avoid more drastic procedures like a mastectomy or chemotherapy. The ACS’s guidelines, like those of the American College of Obstetricians and Gynecologists and the U.S. Preventative Services Task Force, do not have the force of official policy. Health insurers will be taking the guidelines into account when forming their own rules regarding how they pay for mammograms, but whether the ACS is given more credence than the other two groups depends on the individual company. One of the larger risks of the debate around breast screening is that frustrated women may throw up their hands in frustration and avoid the procedure altogether. Whether or not early screening benefits outweigh the false positives is partially a judgment call, which is why the differing opinions are not likely to find consensus any time soon. Oeffinger, K.C., et al., “Breast Cancer Screening for Women at Average Risk: 2015 Guideline Update From the American Cancer Society,” JAMA 2015; 314(15): 1599–1614, doi:10.1001/jama.2015.12783. Cohen, E., et al., “‘I Want My Mammograms!’” CNN web site, November 19, 2009; http://edition.cnn.com/2009/HEALTH/11/19/mammogram.guidelines.insurance/, last accessed October 21, 2015. Cohen, E., “New Breast Cancer Screening Guidelines,” CNN web site, October 20, 2015; http://www.cnn.com/2015/10/20/health/new-acs-breast-cancer-screening-guidelines/index.html, last accessed October 21, 2015.